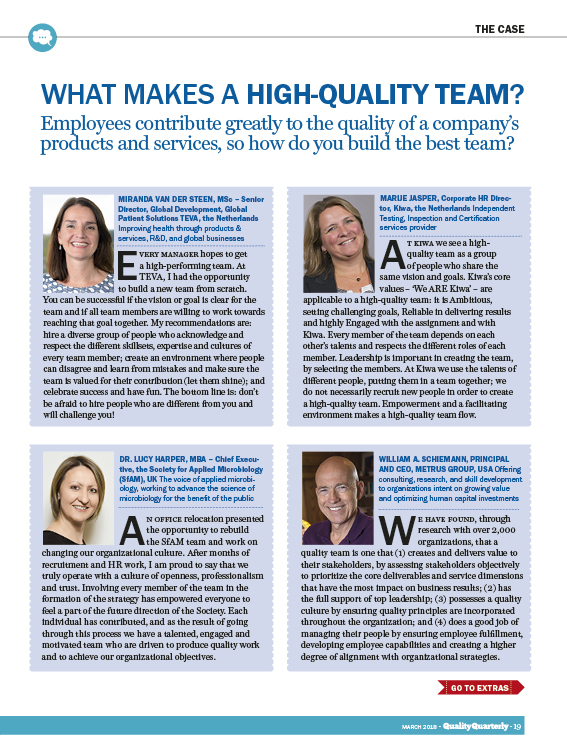 Employees contribute greatly to the quality of a company’s products and services, so how do you build the best team? Quality teams are cognitively diverse – with lots of different perspectives and points of view coming together to deliver on a well-defined common purpose. Believing in each other and knowing where to challenge is vital, which requires individual self-awareness, as well as a clear understanding of colleagues’ strengths and preferences. Mature, high-quality teams tend to be adaptive, and fill in each other’s gaps where necessary, which means honest, close relationships need to be maintained – and any preciousness has to be left at the door. Humour, a tool used equally well for making bonds and for breaking tensions, tends to have been present in the best teams I’ve worked with.